The Pan-Pacific Ho’olaule’a is exactly that: a super-sized celebration of friendship and goodwill; a diverse gathering of people, cultural exhibitions, and talent from across the Pacific Rim that is not to be missed! It is one of the largest outdoor multi-cultural exhibits of its kind in the state of Hawaii and it happens in beautiful Waikiki, right on Kalakaua Avenue! The main thoroughfare is temporarily closed to vehicular traffic from Seaside Avenue to Uluniu Avenue to accommodate this festive and cultural block party. Delicious food booths of every kind line the street, offering ethnic cuisine from around the world, local fare, as well as the all-American hamburgers and fries! You’ll be able to nosh on delightful desserts such as smoothies, ice cream, and shaved ice too! Don’t forget to visit the various island crafters and vendors who sell unique items that reflect the diversity of the islands – hand-crafted gifts, locally created jewelry and artwork, unique clothing items and so much more! Enjoy multiple entertainment stages, featuring cultural performances such as Japanese Taiko drums, Korean dance, Hawaiian music, hula, and more. Take pleasure in the talents of Hawaii’s own home-grown musicians at the Na Hoku Hanohano Charity Stage where popular musicians perform for you live on stage! Participate in a “bon odori,” a Japanese ritual performed in the summer months during “Obon” or “Bon Festival.” During Obon, the Japanese return to their hometowns to honor the spirits of their beloved ancestors and family members who have passed. Townspeople would gather together and dance around an elevated stage filled with traditional musicians, wearing “yukata,” a customary Japanese cotton garment or kimono. It is a ritual not practiced much in Japan anymore, but curiously continues to thrive in Hawaii. 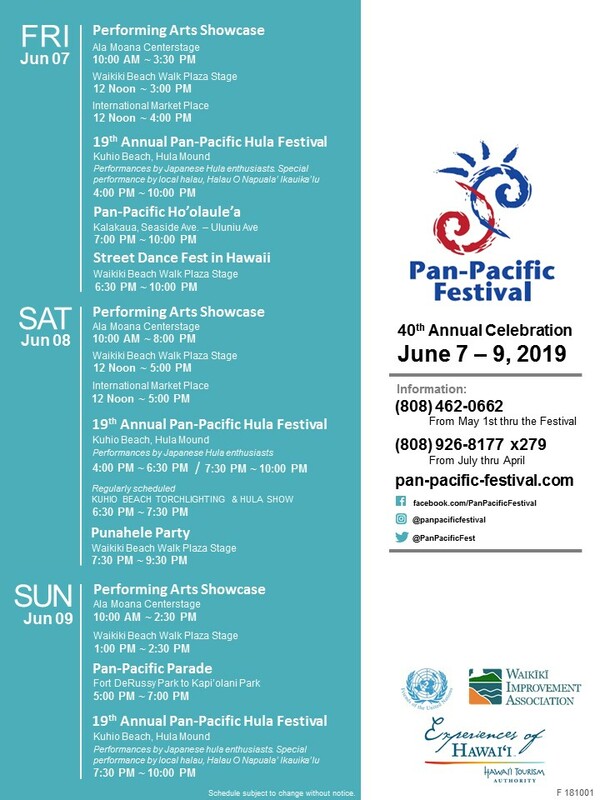 Finally, don’t miss the Pan-Pacific Hula Festival which happens simultaneously at the Hula Mound on Kuhio Beach at the Diamond Head-end of the Ho’olaule’a. Enjoy the sights and sounds of hula being performed under a majestic Banyan tree as the quiet hum of the ocean waves wash up on the shores of iconic Waikiki Beach! Be sure to come to the Ho’olaule’a – it is quite an exceptional and distinct event. Delectable food, beautiful music, and eclectic cultural performances, all under the moon and stars of a dreamy Hawaiian sky.